Newway Towing is a favorite towing and roadside assistance provider in San Rafael. We provide our towing services through a network of independent tow truck operators. Our techs will provide you with premier quality solutions, at highly affordable prices. Our team of trustworthy professionals is always happy to provide excellent service to the local drivers. They are on standby twenty-four seven, every day of the year (including all weekends and holidays), offering a fast response time in San Rafael. If you find yourself in need of roadside assistance just give us a call and we’ll immediately send someone out to assist you. And, with Newway Towing you don’t have to worry about how much the bill will come to because we always give our customers a price quote upfront, so they know how much they will have to pay. Basically, anyone who drives a car. If your car is well looked after you probably won’t need emergency roadside assistance often, although some things, such as flat tires cannot be helped and happen even to drivers who carry out constant maintenance on their cars. Some of the services that fall under our Roadside Assistance category are services that the driver can usually do him or herself, but under certain circumstances they prefer to call Newway Towing to help them, for example if someone needs to change a tire while on their way to an important business meeting or a party that they are dressed for they will prefer to wait a while and have us come and do their “dirty work” for them – after all it did take them days to find the perfect dress. Usually things that fall under roadside assistance such as running out of gas or the car’s battery failing to start occur when you least expect them to and at the most inconvenient times. Don’t worry, the team is always happy to help you out of these frustrating emergency situations. 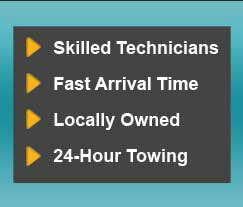 The Newway Towing Team is made up of a bunch of qualified, experienced technicians, all of whom are licensed to work in San Rafael. Each member brings a number of years of experience on the road to the team and each has a broad knowledge of all makes and models of cars. Despite being qualified to carry out their work the team makes sure to also keep up to date with everything that’s new in the industry, both by reading and by participating in refresher courses. In the same vein, the team is meticulous in making sure that their vans are always in excellent condition and are always well equipped with all the gear that the technicians need with them when providing roadside assistance services.